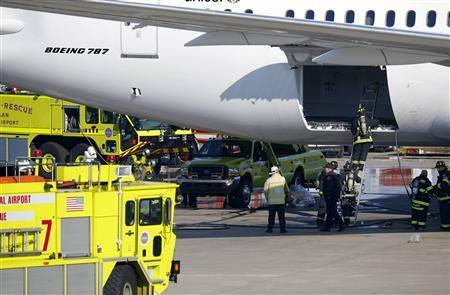 Fire broke out on an empty Boeing Co 787 Dreamliner jet parked at a gate in Boston on Monday, putting safety concerns about the new, carbon-composite jet back in the spotlight and drawing attention from federal investigators. 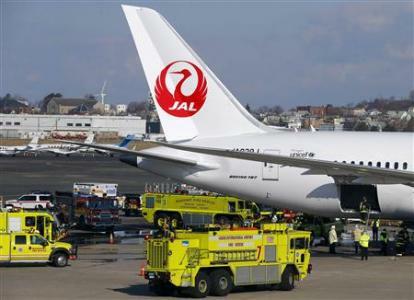 Officials said the fire started when a battery in the Japan Airlines Co Ltd jet's auxiliary power system exploded around 10:30 a.m. ET, shortly after passengers deplaned. A mechanic inspecting the jet discovered smoke in the cockpit while performing a routine post-flight inspection and reported it to authorities at Boston's Logan International Airport, officials said. "Japan Airlines spokeswoman Carol Anderson later said smoke was not discovered in the cockpit. "Smoke was initially discovered by a maintenance staff in the rear end of the cabin, and confirmed by another maintenance staff who also detected smoke outside the aircraft," she said in an email. Firefighters climb into a rear cargo compartment of a Japan Airlines Boeing 787 Dreamliner that caught fire at Logan International Airport in Boston, Massachusetts January 7, 2013. Credit: REUTERS/Brian Snyder. The Federal Aviation Administration and the National Transportation Safety Board are looking into what caused the problem, which came just weeks after Boeing endured a string of other electrical problems that briefly grounded three of the planes. The new jet also has suffered an engine failure and fuel leaks in the 14 months it has been in service. "I don't want to be an alarmist," said Carter Leake, an analyst at BB&T Capital Markets in Virginia. "But onboard fires on airplanes are as bad as it gets. Even though it happened on the ground, rest assured the FAA is asking 'What if it happened in the air?'" The Chicago-based jet maker's shares closed down 2 percent at $76.13 after the news. Boeing spokesman Marc Birtel said Monday, "We are aware of the event and are working with our customer." Other Boeing officials declined to comment. Japan Airlines did not respond to several requests for comment. The Dreamliner is Boeing's first jet to be made of carbon composites rather than aluminum, a change that lowers the plane's weight and allows it to burn less fuel. The jet was plagued by production problems that delayed initial delivery by 3-1/2 years. Boeing currently has nearly 800 unfilled orders for the plane and is ramping up production from five per month to 10 a month this year. Yet since entering service in October 2011, the plane has repeatedly made headlines for mechanical problems. Last July, the FAA investigated an incident in which a 787 engine made by General Electric Co blew apart on the ground in South Carolina, prompting changes in how the engines are made, maintained and inspected. A similar engine failed on a Boeing 747 in Shanghai in September. The Dreamliner's run of electrical mishaps began December 4, when a United Airlines flight from Houston to Newark, New Jersey, made an emergency landing after it appeared that one of its power generators failed. United later said an electrical panel was at fault. On December 13, Qatar Airways said it had grounded one of its three 787 jets because of the same problem United had experienced. On December 17, United said that a second 787 in its fleet had developed electrical issues. Also in December, the FAA ordered inspections of 787s after fuel leaks were found on two aircraft operated by foreign airlines. The leaks stemmed from incorrectly assembled fuel line couplings, which could result in loss of power or engine fire, the FAA said. In the latest incident, a fire crew determined that a battery used to power the plane's electric systems when the engines are not running had exploded. The mechanic was the only person on board the plane when the smoke was discovered and no one was hurt by the blaze. "Passengers were in no danger as this event had happened at least 15 minutes after they deplaned," said Massport Fire Chief Bob Donahue. In late December, Boeing Chief Executive Jim McNerney said the 787 has not experienced an unusual number of problems for a new aircraft, calling the problems "normal squawks." But Monday's electrical fire raised questions about that view and is likely to make Boeing highly susceptible to any other issues that could arise on the aircraft. Wing de-icing and cabin air conditioning systems on the 787 are electrical. If ventilation failed on a flight or the cockpit filled with smoke, the pilots would decompress the cabin to get air and would quickly dive to 10,000 feet, where oxygen levels and temperatures are survivable, said Leake, the analyst at BB&T Capital Markets, who is also a former commercial and military pilot. He said normal teething issues for a new plane might include an engine shutting down at a gate, stuck landing gear or a malfunctioning lavatory. In contrast, an engine breaking up and a fire that fills the cockpit with smoke are "all squawks that, unfortunately for Boeing, could have severe consequences. "Any electrical problem in the next 30 days, for whatever reason, which would be a normal teething problem, is going to be a big deal," he added. "It creates a perception issue."